A typical southern Thai method of cooking prawns, with a great combination of crunchy, spicy and earthy flavours. 1. Blend all of the paste ingredients together in a small blender, food processor or pestle and mortar to a smooth consistency. Marinate the prawns in the paste and chill for at least 30 minutes (or ideally overnight). 2. Meanwhile, cut each lemongrass stalk diagonally into 3 pieces, with an angled end to each piece. Skewer each prawn with a piece of the lemongrass, making sure both ends are pierced. If you’re struggling to push the lemongrass through, make a small incision in the prawn with a knife first. 3. For the dipping sauce, use a pestle and mortar to crush the garlic, chilli, coriander and ginger together to a fine consistency. Scoop into a serving dish and mix in the soy, sugar, lime juice and 2 tsp water. 4. To cook, heat the oil in a pan until very hot. Add the skewered prawns in batches of 5-6 (so as to not overcrowd the pan), making sure the oil covers the prawns, and fry for about 1-2 minutes on high heat, until cooked through. 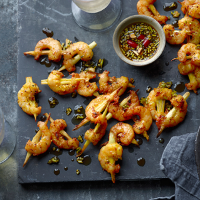 Serve the prawns with the dipping sauce, allowing guests to slide them off the skewers to eat.